Against all odds, Katniss Everdeen has won the annual Hunger Games with fellow district tribute Peeta Mellark. But it was a victory won by defiance of the Capitol and their harsh rules. Katniss and Peeta should be happy. After all, they have just won for themselves and their families a life of safety and plenty. But there are rumors of rebellion among the subjects, and Katniss and Peeta, to their horror, are the faces of that rebellion. The Capitol is angry. The Capitol wants revenge! When I sat down to re-read the first two books in the trilogy prior to the release of Mockingjay next week, I’d planned to review both books then discovered Lou had already covered Hunger Games (http://thebookpushers.com/2009/05/07/review-the-hunger-games-by-suzanne-collins/). So, we’re just going to focus on Catching Fire, the middle child of this particular trilogy. It starts with Katniss home from the games and set up in her new home in Victor’s Village. After the events in the arena, Peeta is distant and Gale barely speaks to her other than on Sundays when they escape to the woods to hunt together. Though she no longer has to struggle to feed her family, Katniss is miserable in her new existence. Things get even worse when President Snow visits her prior to the victory tour he lets her know in no uncertain terms that she has to convince the uprising districts that her act at the end of the games was truly done out of love and not rebellion. During the tour, she does her best to play happily in love, but Katniss can’t ignore the way Peacekeepers step in to murder those in the crowds showing the least defiance of the capitol or the way her mockingjay token shows up everywhere, even in the capitol itself. But when President Snow informs her she hasn’t done a good enough job, she knows things are about to get much, much worse. And holy crap, do they. While Katniss struggles with her feelings for Peeta and Gale, she’s forced to watch people she cares about be beaten, robbed of their livelihood, stripped of their dignity, all while trying to hold together the illusion of a romance with Peeta. When it’s announced that the 75th Hunger Games will be a battle between former victors, she crumbles. For me that was the first of a couple weak points in the story. While Collins let us know Katniss had been suffering from nightmares about the arena since the games, I needed to feel it more in order to really buy into Katniss’s initial reaction to the announcement. And later, in the games, when so many other tributes are teaming up with her and Peeta, she seems incredibly oblivious. Granted, she was focused on keeping Peeta alive, but in the first book, Katniss was not only brave, she was incredibly savvy, not so much this time around. Too many things raised questions in her mind, but she never really attempted to put two and two together properly. With all she’d seen outside the arena and how much support she had, I felt like getting rich had made her stupid. Collins’ writing is still phenomenal and the plot once again moved at breakneck speed in her gritty, terrifying dystopian world, but I miss the smarter Katniss and I really hope she makes a return appearance in the next installment. 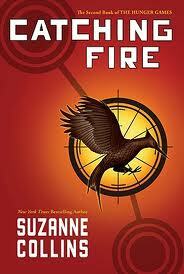 Because no matter what my issues with Catching Fire, I’m still dying to get my hands on a copy of Mockingjay. So, while the first book definitely got five stars from me, the best I can honestly do is give Catching Fire 4.5 stars (and I strongly considered 4.0).